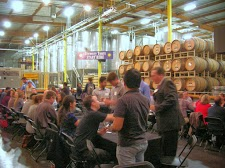 A new variation on networking by the San Diego Biotechnology.Network was a smashing success. 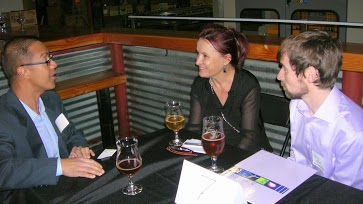 Held at the Green Flash Brewery, the addition of the partnering event offered a great opportunity for companies to meet for 10 minute intervals with individuals wanting to talk to them. This new partnering technique offered great opportunities for both employers and prospective employees. One hundred and fifty meetings took place from 5:30pm to 6:30pm with many companies participating. Speed networking—rotating through numerous individuals in 3 to 4 minute intervals—also went off without a hitch. 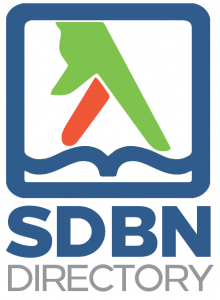 The event is part of the SDBN’s mission to connect local life science companies using online resources and events. Larger conferences, such as the Biotechnology Industry Organization, also taking place in San Diego this coming June, have had much success with face to face partnering meetings. The SDBN event coincided with the JP Morgan Healthcare conference which took place in San Francisco, which is famous for both its exclusiveness (there is no public website) and its formal and informal partnering. The SDBN has plans to leverage its company directory in the future to facilitate local partnering meetings several times a year.